I am in expectation of the arrival of the Post every moment, he usually comes in on Friday Evening, and returns next Morning as he goes no further than Morris Town. . . . I do not know where to direct to you; we are afraid Mr. Jay has lost all his Clothes that were at Kingston. Mama says if your warm Petticoat is lost, she can spare you one, rather than you should suffer for want of it. Papa has been home since Sunday Evening, the Accounts he brought are old now, and not worth writing, on the 23d Inst. 5 or 6 Men of War, warped through an opening they had made in the lower Cheveaux de Frieze*, and came up to attack our Fort and Ships and Gallies but they found the Navigation so difficult, that they set Fire to the Augusta of 64 and the Apollo of 32 Guns, and the rest made the best of their way back again. A few days before 2500 of the Enemy (most of them Hessians) under the command of Count Donolp. attacked Fort Mercer or Red Bank, and were soon obliged to retreat in a most shameful and confused manner, leaving behind them killed and wounded 1500. The Count is a Prisoner—they also left 12 pieces of Artillery. The 22nd our Troops attempted a stroke upon a detachment of six Regiments lying at Grays Ferry [near Philadelphia] where they had thrown a Bridge over the River. They marched all night and reached the Ground about Sunrise, but the Birds were flown, they had suddenly the preceding night deserted the Post, left all their works unfinished and broke up the Bridge. To day Sen’night there was a very warm Engagement, but reports respecting it are so vague, and contradictory, I cannot pretend to give you any account of it. The Articles of Capitulation that appeared in Loudons last Paper are not relished this way, neither by Whigs, nor Tories, the latter say if Mr. Burgoyne was in a Situation to obtain such Terms he ought to have fought, the Former say if Burgoyne was obliged to surrender at all, Gates might have brought him to what Terms he pleased, so that it looks as if the two Generals wished to avoid fighting. The troops will go home and Garrison the Forts abroad, and let those Garrisons come to America—so it will be only an exchange of Men. The Doctor proposes to Inoculate our little Fellow next week. He is now a fit subject for it, his blood is well purified, he has pretended to inoculate him often, so he will not be afraid of it. You know old Woodruff, that carts for us, his Son that lived next door to Dr. Darby, died a few days ago of the Small pox the natural way, and now his Widow and Child have it, the old Man has never had it, he stayed in the same House with his Son till a day or two before he expired, they are not entitled to much pity, for they say the Avarice of the old Man prevented their being inoculated. The Child will perish with it, it is thought. . . . . Our house is a Barrack there was a whole Artillery Company in it, so I expect every thing will be destroyed. We have not heard from B[rockhol]st [her brother]** since the last action to the Northward. (I have no doubt but his Letters have miscarried) but Mama has allmost persuaded herself he is among the Slain, and if there was any mourning to be purchased, I do not know but she would exhibit a dismal Spectacle of bombazeen and crepe. . . .
We had the Taylor here (that you engaged) these three weeks, which has kept Kitty tightly employed. She is his Journey-woman. Mr. Jay’s green suit is turned. Papa has brought home a Cargo of broken things, so that we have not eat the bread of Idleness since you left us. . . . I think this scrawl as it is . . . entitles me to a few Lines from your fair hand. This I submit to you and whether you write or not, I am yours most Affectionately. ** Brockholst was a lieutenant colonel and an aide-de-camp to General St. Clair in 1776 and 1777. Susan makes reference to the battle of Saratoga which the Americans under General Horatio Gates won over the British and Hessian forces under General John Burgoyne. The Articles of Capitulation were very generous allowing what was called the Convention Army to to return to Britain on the condition that they not serve again in America. Both Gates and Burgoyne were criticized as Susan notes. Can you imagine a man, especially a buttoned-up one like John Jay, wearing a green suit!! Source: John Jay: The Making of a Revolutionary, 1745-1780, edited by Richard. B Morris (New York: Harper & Row, 1975), 445-47. 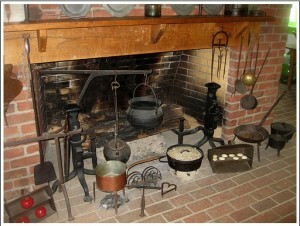 Most cooking in eighteenth century kitchens was done over a wood fire on the open hearth of a large fireplace. 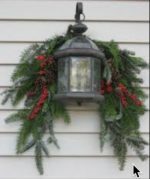 There was usually a crane or trammel to which a cast iron pot (or pots) was attached by a hook. The pot could be raised or lowered and swung out over the hearth to be emptied or added to. Hearths were quite large and extended out into the room so that hot ashes could be shoveled out from the main fire to construct what in effect were small “burners” on the hearth apron over which pans on trivets could be placed. Long legged pan called spiders (on the right in the illustration) were also used, mainly for frying. Heat could be regulated by the size of the piles of ashes and kept up to temperature by the addition of more hot ashes from the main fire. There were other kinds of cookware in use like Dutch ovens, small three-sided ovens using reflected heat for baking biscuits, for example, as well as ingenious roasting devices including spits, and even toasters and waffle irons, several of which can be seen in the illustration. There was usually a baking oven in the wall on one side of the fireplace, with a small flue to the chimney, called a beehive oven because of its domed shape. Heating it involved building a fire on the brick floor and, when the floor and sides were heated to the correct temperature, the fire was shoveled out and the items to be baked placed, using a peel, on the floor of the oven, avoiding the excessively hot spots. Then a metal door was inserted into the opening to contain the heat. Bread and pies were baked first as they required the highest temperatures. When they were finished other dishes and casseroles that cooked at lower temperatures could be added as the oven cooled. And when the oven was barely warm it could be used to dry herbs for example. I marvel at the efficiency which with these brick ovens were used. In the late eighteenth century, however, improvements began to be introduced. Cast iron ovens fitted inside the fireplace itself were a new feature. Sarah Livingston Jay, recovering from an illness at her sister Caty Livingston’s home at Oak Hill on the Hudson River, wrote of such a one to her husband John who was in the process of building a home in Bedford in Westchester County, New York, to which the two hoped to retire. The tender interest you take in my health is most grateful to my feelings, & redoubles the satisfaction I have of assuring you that it still continues to mend. When Brockholst [Sarah’s brother] was here he mentioned to Mr. Livingston that he had had an iron oven fix’d in the Jam of his Kitchin fire-place so constructed as that the smoak & heat from the Kitchin Chimney kept it perpetually hot & that all the meet, puddings, Cakes & Custards used in his family were cooked in it, so that it had superseded the use of spits & tart pans &c. There is but one that fixes them & he has thirty dollars for the Oven & fixing it in the Jam. I thought best to mention it before you shd. have built yours. If you think it worthy yr. attention you can let Peter [their son] examine his Uncle’s, & inquire of him the person’s name who makes them. Brockholst says his Cook says it saves half the work of Cooking, a great deal of fuel & being in constant readiness is inconceivably convenient. Mr. L. says the person’s name is Batchelor, a white smith*. . . .
Sarah Jay’s letter can be found on page 276 of Selected Letters of John Jay and Sarah Livingston Jay by two colleagues and myself; for details click on the image at the bottom of the column on the right. The illustration is of the KITCHEN c.1800 at Blennerhast Mansion on an island in the Ohio River. More information about housewives and cooking can be found HERE beginning on page 203.